"These moist muffins were created in my kitchen while trying to bake with whole wheat flour, which has more fiber than all-purpose flour." Preheat oven to 375 degrees F (190 degrees C). Spray 10 muffin cups with cooking spray. Whisk 1 1/2 cups sifted whole wheat flour with baking soda, baking powder, salt, and 1/2 teaspoon cinnamon in a large bowl. Mix together mashed bananas, 1/2 cup melted unsalted butter, egg, white sugar, and vanilla extract in a separate bowl. Gently fold banana mixture into dry ingredients just until moistened; do not overmix. Spoon batter into prepared muffin cups, filling them about 3/4 full. Mix dark brown sugar with 2 tablespoons whole wheat flour and 1/2 teaspoon cinnamon in a bowl, stirring until combined; mash 1 tablespoon unsalted butter into the mixture with a fork until streusel topping resembles crumbs. Sprinkle topping over muffins. Bake muffins in the preheated oven until a toothpick comes out clean or with moist crumbs, about 20 minutes. Sifting the whole wheat flour adds air and allows the wheat flour to become lighter, so that the muffins are less dense. 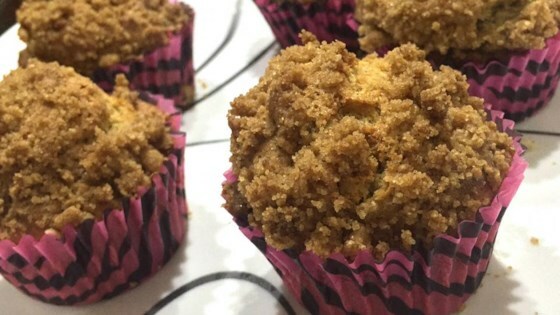 Great whole wheat alternative to the popular "Banana Crumb Muffins" recipe. Made these muffins several times, store them in the freezer, and they are great! I was looking for a use for my over-ripe bananas and I only have whole wheat flour. I made these exactly according to the recipe. They were so easy and very delicious. I would highly recommend. This recipe turned out amazing! I got 12 muffins and they were fully cooked at 18 minutes. Followed recipe made this twice now. A little too sweet. Will be cutting back on the sugar next time.